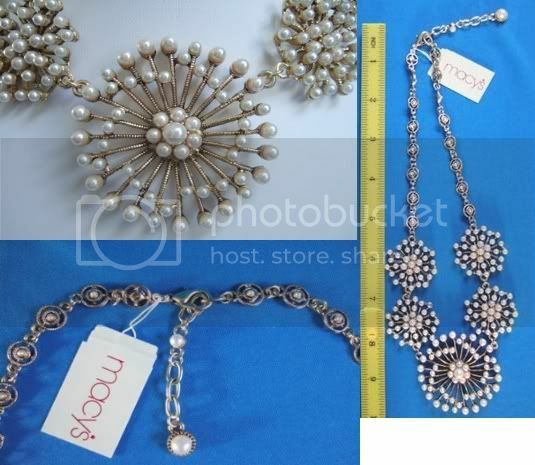 I buy lots of my costume jewelry from an ebay seller (MyTag) who buys clearance lots from Macy's. Most of my necklaces that cost a few dollars came from said seller. The most recent item I bought was inspired by Patina :-) It was $12 shipped, and the most expensive thing I have bought from them. I can't wait to get it! Check them out from time to time, see if you like anything they have. Thanks for the info! I am learning so much from your postings. thanks for sharing this,he seems to have some really good stuff, i love the one that you bought. These are very pretty, I'll be sure to check out the Etsy store! Oops, Ebay, Etsy, it's all so confusing!! Thanks for the link, anyway. i posted it on my blog this past fri or sat...received it today loved it...thanks! I just placed my first order with them. Thanks for the info!